Type “history of the telegraph” into a search engine and the results will point you to Samuel F. B. Morse. History largely credits him with the invention of both the electromagnetic telegraph and Morse code, which enabled people to send instant messages across long distances. With Morse’s successful test of the electromagnetic telegraph on May 24, 1844, the potential for worldwide communication changed forever. The message he sent, “What Hath God Wrought?” traveled via his electromagnetic telegraph from Washington, DC to Baltimore, MD. But who, you might wonder, was on the other end of the line? Alfred Vail, Morse’s colleague, received Morse’s message in Baltimore and then successfully returned the same message back to Morse in the national Capitol Building’s Rotunda. For Vail, this event was the culmination of years of his own labor and financial investment, yet his influence has largely been lost in the historical record. Born to Bethiah and Stephan Vail on September 25, 1807 in Morristown, New Jersey, Vail’s father owned the Speedwell Iron Works where, after completing public school, Vail worked as a machinist. In 1832, he began coursework in theological studies at the University of the City of New York, now New York University, with the hope of becoming a Presbyterian minister. 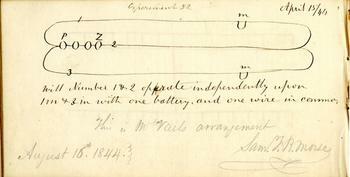 However, in 1837 Vail saw Morse demonstrate an early version of his electric telegraph at the university, and shortly after convinced Morse to take him on as a partner. The contract between the two, stated that Vail—for a share of interest in Morse’s rights to the telegraph—would work on constructing the telegraph machines and financing the American and foreign patents. Vail vastly improved Morse’s original design of the machine. Instead of using pendulums, Vail added weights to the machine’s turning key. He also substituted a steel pointed pen for the pencil Morse had employed, to indent the code into the paper tape the machine used and improved the mechanics of the register, the instrument that punched out the code via electric impulse, as well. 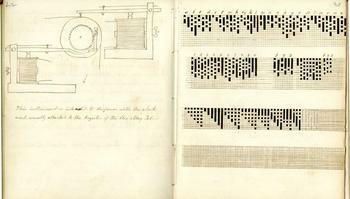 Additionally, Vail developed a simpler alphabetic system of code to replace Morse’s original, but more complicated numerical code, in which dashes and dots were interpreted as numbers and then translated into words in a code book. Vail’s alpha code greatly sped up the process of deciphering messages. Though his contributions to the project were extremely significant, it was Morse’s name that appeared on the patents. Consequently, Morse is remembered, and Vail is often not. But, that is the great thing about archives: they save the history, and fortunately for me, the Smithsonian Institution Archives holds Vail’s papers in Record Unit 7055. His papers contain research notebooks, correspondence with Morse, letters to family, patent applications, journals and scrapbooks, all documenting the development of the telegraph and Vail’s personal and professional life in the 1800s. Needless to say I was fascinated by reading through Vail’s scientific journals and his correspondence with Morse. From these materials which shed light on the rapport that he and Morse had with one another, I learned about Vail’s impact on the project. What is perhaps ironic about this, is that Vail’s papers eventually came to the Smithsonian. In 1845, Vail published a book about his experience working with Morse on the electric telegraph. Vail wrote about some of the previous work done by others on telegraphs that influenced his and Morse’s work. However, Vail’s account failed to give recognition to Joseph Henry, first Secretary of the Smithsonian, who met with Morse and had invented the high intensity magnet used in Morse’s electric telegraph. For several years, a controversy ensued over the degree of Henry’s contribution to the mechanism. (For more about the controversy read David Hochfelder’s article, Joseph Henry: Inventor of the Telegraph?). So, “What Hath God Wrought?” For Alfred Vail it would seem to have been a lack of notoriety. However, in reading his letters, it seems that fame was neither his motivation nor goal. Vail’s work on the electric telegraph provided him with a life’s work and sense of accomplishment. And maybe, for him, that was enough.